These Audio Recording Guides and Tips are courtesy of Silent Way Remote Recording and Media Asset Management in San Francisco. NOTE: The CR-1604 was replaced by the much-improved 1604VLZ, then the VLZ PRO, then more versions, all of which fixed this problem. The VLZ improved almost everything about the mixer, including real direct outputs, inserts on every channel, sweepable EQ, 4 busses, better monitoring control, and cleaner signal-to-noise specs. Then the VLZ PRO version came out which improved the mic preamps again. This "ring hot" wiring is completely backwards but thankfully this is the only time I've ever seen this! Therefore, if you use a TRS--> XLR cable to run a mix from the 1604, double check that it is wired correctly for your standard (ie. tip-->pin 2 or 3). A cable wired "tip-->pin 2" would actually be running the hot signal to pin 3 and vice-versa. No matter which device is receiving your mix, check how the cables are wired and be prepared with phase reversal adapters. Mackie tech support says that changing the jacks' wiring is not an easy modification to make, as the jacks are board-mounted. If you use unbalanced plugs in this jack, it is wired "tip hot," and the output is 6dB lower than the Balanced output. The 1604's Mono Main Out is similarly capable of either Balanced or Unbalanced output (and the unbalanced signal is also 6dB lower). It combines the Right and Left Main Channels and, according to the manual, "the polarity is reversed" (with respect to the main outs). This means that this output is correctly "tip hot," but is out of phase with the stereo output (meaning the stereo output, if summed to mono, would be out of phase with the mono output.) ...Whew! To use the 1604's Channel Access (on channels 1-8) as a direct out without signal interruption to the master, insert an unbalanced 1/4" plug to the "first click." 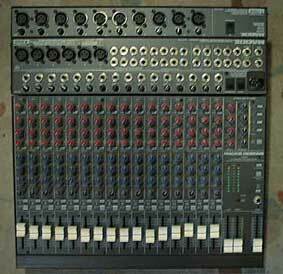 This is a POST-Fader, POST-EQ feed, useful for sending channels to a multitrack. If you insert a unbalanced cable all the way, it will interrupt the signal to the main mix bus. See the Mackie Mixer Applications Guide, 2nd Edition for modifications to make the Channel Access points Pre-EQ/Pre-Fader or Pre-Fader/Post-EQ. This also shows how to make the Aux Sends into Monitor Sends with or without EQ, how to make the Aux Sends ignore Mute/Alt status, and mentions a mod to tie the Solo together on two or more 1604s. By the way, HOSA STP-201 Send/Return cables (TRS--> two unbalanced 1/4" Plugs) are wired so that the Orange plug is the Tip (send) and the Grey plug is the Ring (return).